Each year, Ballarat Iyengar Yoga offers two yoga scholarships to people who have completed a Beginners course and who want to pursue their yoga study but find that they are financially constrained to do so. Each scholarship place will fund 50% of the fees of one yoga student to attend General or Experienced level classes twice per week. The duration of each scholarship will be six months. The scholarships are being financed initially by a very generous but anonymous benefactor. Ongoing financing for these scholarships, will be raised by hosting fundraising events such a film nights or pot luck dinners once each term. Event dates coming soon. If you would like to apply for the scholarship, download the application form below, print it out, fill it in by hand and return it to us either in person or scan and email it back to us. Applications for January-June funding open November 1st and close November 30th. Applications for July-December funding open May 1st and close May 31st. Ballarat Iyengar Yoga and Fifteen Trees have joined forces to plant 100 trees together each year. At one end these trees will reduce the carbon footprint of the yoga studio, at the other they provide biodiversity to the planet and habitat to our native wildlife. The trees were planted at Alexandra, Vic as part of a 4 year project. The aim is to enhance existing vegetation and improve the water quality in the creeks that run through the district. 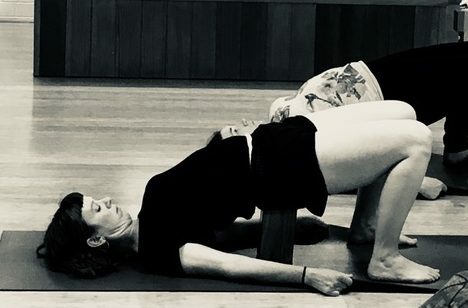 Ballarat Iyengar Yoga is connected to a broad network of Iyengar schools and teachers across Australia and the world. Iyoga props is where we source most of our props online. Based in Yarraville Melbourne.